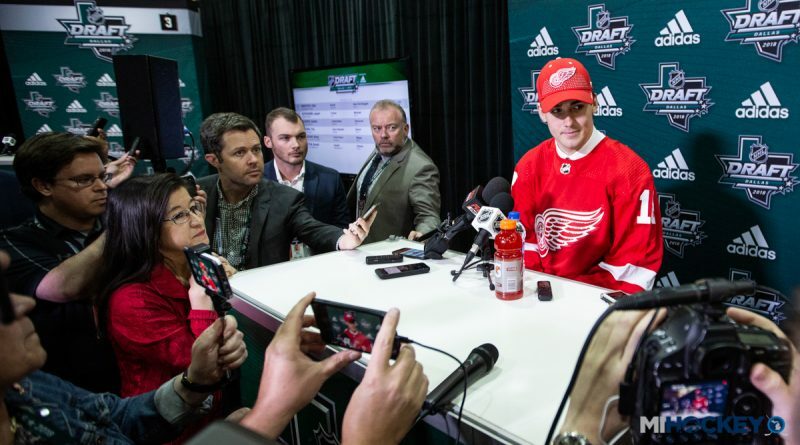 DALLAS – When the 2018 NHL Draft came to a close Saturday afternoon in Dallas, the Detroit Red Wings had added ten new members to the organization. After selecting Filip Zadina and Joseph Veleno in Friday’s first round, the Wings added eight players on Day 2 – three forwards, three defensemen and two goaltenders. The headliners of draft class, of course, are the two first-rounders; both Zadina and Veleno were considered ‘steals’ by Detroit because neither were projected to be available in the No. 6 and No. 30 spots, respectively. Zadina was regarded as a sniper who isn’t afraid of playing defense. A native of the Czech Republic, he had no problems adjusting to the North American game, as Zadina posted 82 points in 57 games with the QMJHL’s Halifax Mooseheads in 2017-18. Veleno, meanwhile, received high praise from Red Wings director of amateur scouting Tyler Wright in the comparison he made, as Wright brought up Dylan Larkin when discussing the new Red Wing. The selection of Veleno came from the draft pick the Wings acquired in the Tomas Tatar-to-Vegas trade. The Wings resumed their stockpile quickly Saturday morning, as they had two of the first five picks in Round 2. With the No. 33 overall pick, they took another forward, this time in Swedish right winger Jonatan Berggren. While the first two picks were players with pre-draft rankings much higher than where they were picked, Berggren was the first slightly-off-the-board pick, as he was ranked No. 24 among all European skaters by NHL Central Scouting. At No. 36 overall, the Wings started chipping away at the glaring hole at the NHL level – defense. The selection of Jared McIsaac – another Halifax Mooseheads product – started a trio of blueliner picks for the Wings. McIsaac could be considered another ‘steal’ as he was ranked 13th among North American skaters by NHL Central Scouting, and 12th in the midterms. A 6-foot-1, 189-pound native of Dartmouth, Nova Scotia, he was named to the QMJHL All-Rookie Team after leading Halifax defensemen in goals, assists and points (9-38-47). 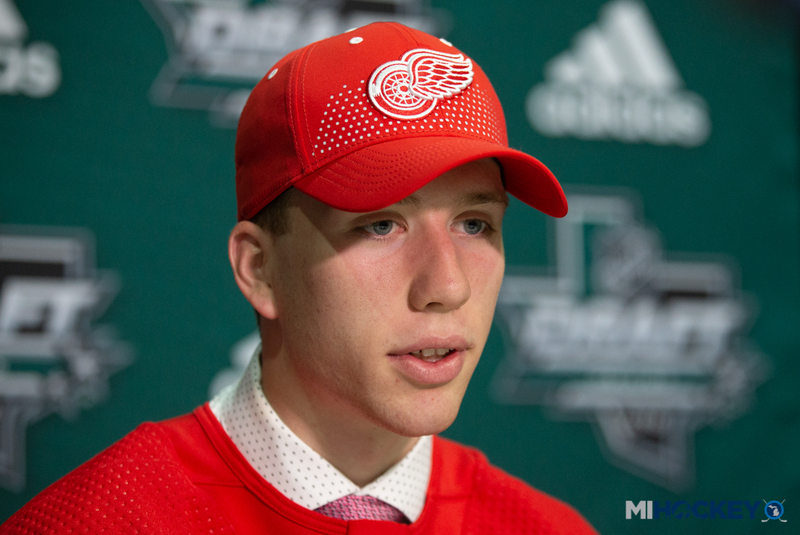 In the third round, the Wings had three picks, and they started by selecting the potential new hometown hero – West Bloomfield native Alec Regula. The London Knights blueliner won a state title with Cranbrook Kingswood before making the jump to juniors; in 2017-18, he posted 25 points in 67 games as an OHL rookie. His size is certainly a plus – Regula checks in at 6-foot-4 and 203 pounds. Later on in the third round, the Wings selected Seth Barton, a 6-foot-2,174 blueliner from the Trail Smoke Eaters of the BCHL. Barton, a University of Massachusetts-Lowell commit for 2019-20, racked up 33 points in 49 games. The Barton draft pick came from the Wings’ trade with Philadelphia for Petr Mrazek. From there, the Wings started working on their depth between the pipes. With the No. 84 pick – acquired in the Pittsburgh trade for Riley Sheahan – the Wings claimed goaltender Jesper Eliasson. A native of Eksjo, Sweden, Eliasson split time between the Under-18 and Under-20 teams for IF Troja-Ljungby; with the U20s, he recorded a .930 save percentage and 1.93 goals-against average. Meanwhile, he was named the best goaltender in the U18 league. NHL Central Scouting ranked him No. 11 among European goaltenders. 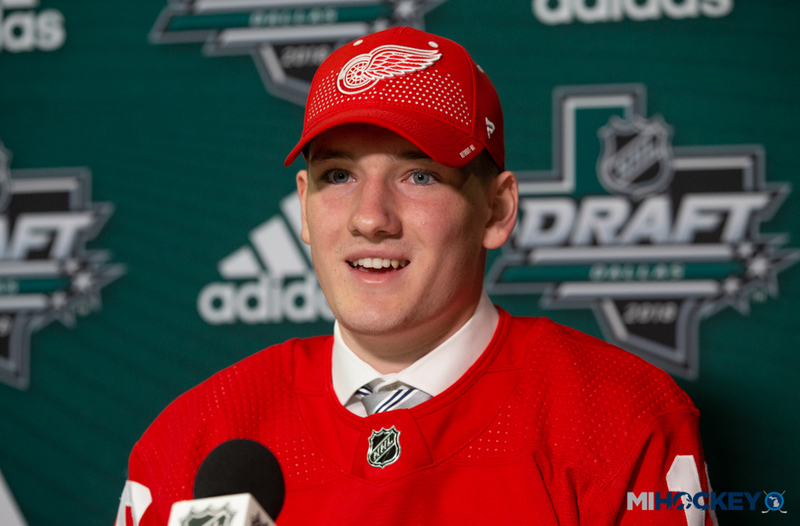 The Wings selected another hometown hero in the fourth round – a 2018 NHL Draft hometown hero, that is. Detroit claimed Ryan O’Reilly, a Dallas, Texas native, with the No. 98 overall pick. It’s another one that looks good on paper, as O’Reilly was ranked No. 58 by Central Scouting. O’Reilly played for the USHL’s Madison Capitols in 2017-18, and finished second in goals by a rookie with 21. He is a University of Denver commit. The Wings traded the No. 159 pick to Columbus in exchange for a fifth-round pick in 2019. One pick later, the Wings used the No. 160 pick on goaltender Victor Brattstrom, a 21-year-old netminder who spent the 2017-18 campaign playing professionally for Timra IK in the Swedish Allsvenskan – Sweden’s second-highest league. A 6-foot-5, 198-pound native of Goteborg, Sweden, he helped his team earn a promotion to the Swedish Hockey League – the top league – in 2018-19. The Wings wrapped things up with the selection of center Otto Kivenmaki, a native of Finland who played at a point-per-game place for the Assat Under-20 club. He checks in at 5-foot-8 and 154 pounds, so he will be spending some time in the weight room before making a push for NHL duty.